"JFK and Obama, Loners In Chief" describes JFK in the Senate, Pathway to the Presidency as "A finely drawn new book (that) illuminates the eight years Kennedy spent in the Senate...all during Republican Dwight D. Eisenhower's presidency. These eight years, Shaw shows, were a crucial training ground for presidential leadership. (He) states that Kennedy's evolution in the Senate meant that he mastered the nuances of American politics. He played the outside game, but he also knew the insiders code and the geography of power." "JFK's Echoes Still Heard In U.S. Senate"
"The Literary Search for JFK"
"John F. Kennedy's Senate years: More like Obama than his brother." That's the assessment of author John Shaw, whose new book, JFK in the Senate: Pathway to the Presidency, examines the president-to-be's eight years in the U.S. Senate. "New book focuses on JFK's time in the Senate"
"Lessons JFK could teach senators about running for president"
"Senator Cruz, You Are No Jack Kennedy"
The cover of Sunday's Washington Post Opinion Section features an illustration of JFK surrounded by some of the many new books about him, but only 10 titles are visible—including JFK in the Senate! The book is also listed in the accompanying article, "A Roundup of New Books on John F. Kennedy." I was interviewed about the book in "JFK Transformed: From the Senate to the White House." I'm quoted in Politico's article "JFK 50th draws media tidal wave"
BookReporter.com asked for my list of the must read books about JFK's Senate years—in addition to mine! "The Search for Senator John F. Kennedy: Author John T. Shaw Recommends 10 Books About JFK's Forgotten Years in the Senate"
The Washington Post's popular "In the Loop" column highlighted JFK in the Senate. "Using JFK's Senate tenure as a guide to carving a path to the White House." Huffington Post blog—When JFK Judged the Senate's Greats. Senator John F. Kennedy chaired an intriguing Senate committee in the mid 1950's to determine the five best senators in American history. It was the only project that JFK was fully in charge of during his Senate career and he worked on it with skill and creativity. The History News Network website ran my essay "Seven Lessons for Presidential Aspirants from JFK." I recently received a nice letter from former Senator Richard Lugar saying he liked this essay and wished I had written it—and he had read it—before he ran for president in 1996. But he didn't say if he would have run differently—or not at all! 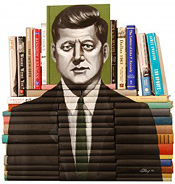 Politico lists JFK in the Senate as one of 47 books to look for this fall. Why they chose 47 remains a question! New York Times' JFK book list includes JFK in the Senate. "A Camelot Nostalgia Tour for Those Who Remember, and Those Who Don't"